ZUCA Ice Dreamz Insert & Frame. Glistening. Gliding. Graceful. 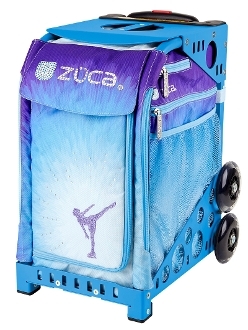 The dreamy design of the ZUCA Ice Dreamz Insert & Frame with rhinestone accents makes your skating fantasies crystal clear. These bags are great for kids in competitive sports. You can use them to haul all your gear and you can sit on them when seating is limited at competitions. Can also be used as weekender bags when you purchase the Pro Packing Pouches.